The IT industry is one of the most booming industries of all times and everyone wants to be a part of this ever-growing sector. If you love technology and all related aspects, then you should take admission in an elite college that offers an MCA program. Our MCA entrance coaching in Delhi, Munirka will help you get through the entrance exam that you need to clear for getting admission to an elite college. We offer diligently prepared tutorial to our students so that they stay a step ahead of the other applicants. Master of Computer Application course is a professional and sought after 3-year long course that trains students to become better in the world of application development. Students gain an in-depth knowledge of different programming languages necessary to design new applications or software for different companies. MCA colleges use the right mix of practical and theoretical teaching that polishes every MCA aspirant. To become eligible for an MCA entrance exam, the candidate must have completed BCA/B.Com/B.Sc/BA degree. The aspirant must have had mathematics as a compulsory subject in his 10+2 education. Elite colleges mostly prefer candidates that have secured at least 50% marks in the bachelor’s program. The marking scheme and other related information varies and depends on the university or college for which you are applying for. BIT MCA, DU MCA, IPU CET MCA, JNU MCA, and NIMCET are some of the top MCA entrance examinations organized across the country. The DU MCA exam, for example, conducts an online test of 2 hours. The exam tests applicants on computer science, mathematics, logical ability, and English sections. They deduct one mark for wrong answers and award 4 marks for each correct answer. You can visit our MCA entrance coaching in Delhi for getting detailed information on all MCA entrance exams and our offered course. Some BCA graduates get confused whether or not to pursue the master’s degree after their bachelors. IT industry, both national and international, is always on a hunt of skilled MCA graduates. As an MCA, you can get recruited as an app developer, ethical hacker, database engineer, quality analyst, software consultant, and many other similar roles in both IT and non-IT companies. If you wish to join a prestigious MCA college, then enroll for our upcoming coaching classes for DU MCA entrance test at the earliest. You can find a number of institutes offering coaching classes in South Delhi for preparing the MCA aspirants, but not all will go that extra mile to help students with their preparation. Our MCA entrance coaching classes in Delhi is a well-known and reliable centre that has prepared an endless number of students for the MCA entrance exam. Most of the students are now studying in top-notch institutes. Being an elite MCA entrance coaching in Munirka, Delhi we receive various enquiries from students from different areas. Some areas include Hauz Khas, JNU, Saket, Ber Sarai, Malviya Nagar, and many other. You can visit our coaching institute to get your queries solved. 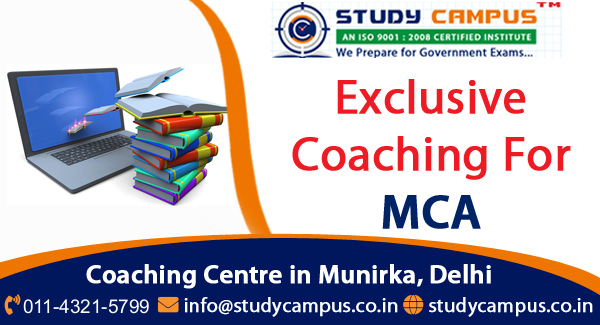 If you wish to clear the MCA entrance exam with flying colors and end up getting admission to your dream college, then join our MCA entrance coaching in Delhi, Munirka at the earliest.